The Indian rupee (INR) breached above the 65 level against the US dollar this week, a level previously seen in November. The week looks set to end with the biggest weekly INR depreciation since the third week of November 2016, when demonetisation hit the currency hard. A deluge of negative news from derailed consolidation of public finances, which first came to the fore in the third quarter of 2017, to last week’s report of a $1.8bn scam at a nationalised bank have depressed the currency. India’s broader economic performance hasn’t been any friendlier either. A recent BBC article titled “The Indian coin that set off millions of messages” caught our eye. The article talks about falling acceptance of small (10 rupee) denomination coins and the Reserve Bank of India’s (RBI), the central bank, efforts to restore public trust in the legal tender. The article also points to a potential crisis of confidence in the currency. Is this really the beginning of a crisis in confidence? Maybe or maybe not. The hit to confidence mainly comes from India’s fragile banking system, with scams adding to the already high level of non-performing assets (NPAs), hitting banks’ balance sheets and the credibility of their operations. These scams undermine the government’s drive to clean up the banking system, the latest and most significant of which is the INR 2.1tr recapitalisation programme for public sector banks. The programme is slated to be implemented over two years, though almost half of it will be front-loaded in the current financial year ending March 2018. Recapitalisation is positive but it also raises the risk of more NPAs. Delayed consolidation of public finances, a widening current account deficit and elevated consumer price inflation have been the main negatives for the rupee. These forces are likely to remain in play for some time. On a positive note, an expansionary fiscal policy with increased spending in the election year should provide some boost to growth this year. The RBI has little scope to raise interest rates but the country’s rising foreign exchange reserve provide it with wriggle room to support the currency. India’s reserves hit the $400bn mark in November and have since risen to $417bn despite all the economic jitters. The fourth-largest reserves in Asia (after China, Japan and Taiwan) cover almost a year of Indian imports, at four times short-term external debt ($93bn as of September 2017). Domestic economic jitters typically expose the vulnerability of the rupee, getting worse during times of global market turbulence. INR is Asia’s weakest currency this month, with 2.2% month-to-date depreciation. The current situation resembles that of late 2011 when the INR came under intense weakening pressure from domestic and external factors. 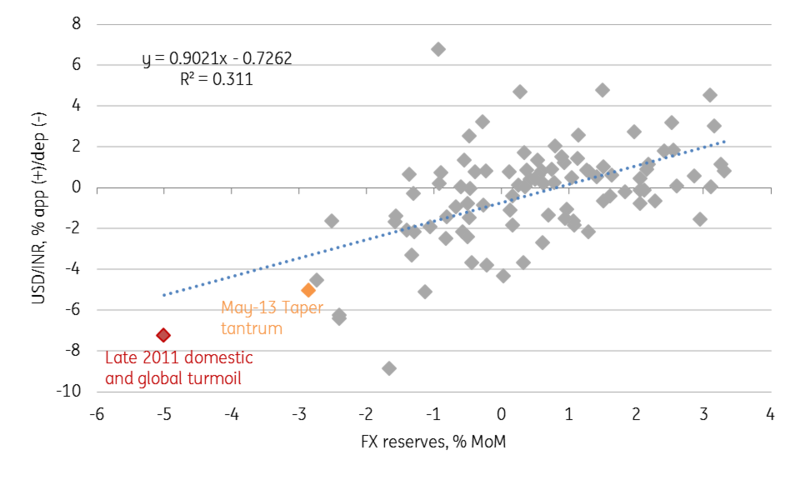 A significant run on the currency is associated with large reserve outflows – the extreme dots in the negative quadrant of the chart plotting monthly reserves and currency moves (see chart). 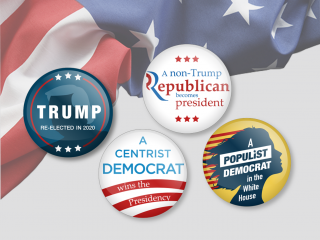 We don’t think we are at a juncture of a crisis. Moody’s recently upgraded India’s investment grade rating with a stable rating, the first upgrade in more than a decade. S&P and Fitch maintaining their stable rating outlooks suggests a ‘no crisis’ situation. Moody’s described the budget for fiscal year 2018-19 as striking a balance between fiscal prudence and growth. While it may be too early to call it a crisis, the present weakening pressure on the INR is unlikely to go away any time soon. Our end-2018 USD/INR forecast is 65.8 (spot 65.0).